(The Guardian): Gordon Brown has labelled a looming British Airways cabin crew strike as "unjustified and deplorable" this morning, as the government steps up the pressure on the Unite trade union. The prime minister turned on one of the Labour party’s biggest donors after conversations with the Unite leadership failed to produce a breakthrough at the weekend. Meanwhile, British Airways is preparing to announce its strike-breaking schedule later today after pledging it will run up to seven out of 10 flights during a three-day cabin crew walkout due to begin on Saturday. BA’s chief executive, Willie Walsh, said yesterday that he hopes to run up to 70% of BA’s daily schedule during the walkouts. 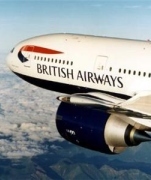 The BA flight from Heathrow to Grand Cayman has been cancelled.